It seems this old adage still rings true. Yesterday the Pittsburgh Penguins finally gave their fans what they wanted. The new 3rd jerseys are the glorious black and gold ones worn back in the late 80's, early 90's. Fans have been clamoring for these jerseys for years. The powder blue ones from the early days of the Pens harkened back to a time when the team was new and not very good. The darker blue ones seemed to have a curse upon them as bad things happened in games in which they were worn. Now, fans are finally getting what they've wanted all along. Even fans of other teams fell in love at first sight. Jealous of a hockey teams jersey, my life story. Add the Pens 3rd jerseys to the list..
Of course, some fans of the Philadelphia Flyers were unimpressed. 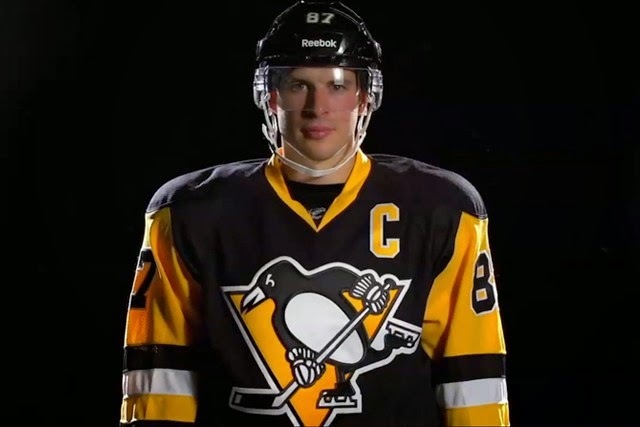 Idc what anyone says, Pens 3rd jersey is fugly. The biggest outcry came from a city with a complex about other teams wearing colors that the Bruins didn't wear first: Boston. Most of you probably know about the bad blood in Boston when it comes to the Penguins wearing black and gold. The reason they are so upset is because they don't clearly remember what happened back in 1980. For those that don't, let me briefly explain. Back in 1980, the Pittsburgh Pirates' "We Are Family" had just won the World Series and the Pittsburgh Steelers were once again kings of the NFL, winning their 4th Lombardi Trophy in 6 years. They were what brought about Pittsburgh's nickname, "City of Champions." More importantly to this tale: They both wore black and gold. It's not as if black and gold was an arbitrary choice. Those colors are deeply engrained into the city itself, as shown by the city's flag. So it's easy to understand why the Penguins, a middling team that ranked a distant 3rd in popularity in Pittsburgh, would want to "cash in" on the city's success and endear themselves to locals. The Bruins did not approve. They protested the Pens' color choice and they claimed that they had been wearing the colors for 55 years at that time, dating back to 1924. Bruins GM, Harry Sinden, said, "We had our colors longer than the Steelers had theirs!" Paul Martha, Vice President of the Penguins, retorted, "I have documented proof that the old Pittsburgh Pirates, a National Hockey League team in 1926, wore black and gold uniforms and at the same time Boston was wearing brown and yellow, before they changed in 1933." Even earlier than that were the Pittsburgh Yellow Jackets, an EAHL team, that wore black and gold dating back to 1915 until they became the NHL Pittsburgh Pirates in 1925. The NHL agreed with the Penguins, ruling in their favor, and the Bruins have been upset ever since. Now that the Pens have returned to that color scheme from "Vegas Gold" with their 3rd jerseys, this chowder-eating city to the northeast began to chime in. See ya on March 14th, as this is happening! So, Bruins fans have to once again have to swallow the reality that their original colors were brown and yellow, not black and gold. It could be said that the Bruins are the copycats here. I hope that Boston fans come to grips fast, as March 14th will be just around the corner.